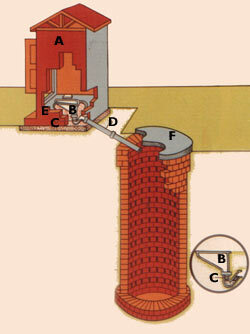 C. 2-3 CM WATER SEAL TRAP. D. 8-10 CM STONEWARE SEWER OUTLET PIPE. E. LEACHPIT, 1 M. DIAMETER & 4 M. DEEP, CONSTRUCTED IN HONEY COMBED MASONERY. F. CEMENT CONCRETE COVER LEACHPIT. Dry (Bucket) latrine can be easily converted to this PRAI. There is no odour nuisance. It is scientific & Hygienic. The cost of construction of this latrine for a family ranges between Rs. 2200.00 – 2500.00. There is no need of a Scaverger for maintaining it clean. It is a water sealed latrine. Oly a little amount of water is required for cleaning. The Urine, Nightsoil & Water is led to a leachpit where everything is absorbed into the soil & it supplies useful manure.